The best thing about being married is that you can just be yourself around your spouse. What happens if that man has a great sense of humor too? Well, that’s the icing on the cake! Scroll down to see 18 pictures of hubbies with a bagful of humor to put a smile on your face. #1 When you take too long to get ready and your hubby waits (im)patiently. 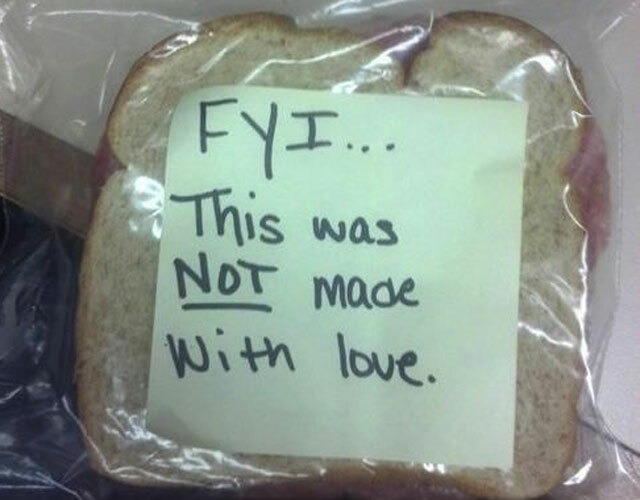 #2 Not all meals are made with love! #3 Wonder if the wifey will be happy with this. She wanted jewelry for Christmas. #4 When asking the hubby to wrap his own presents can give a different look. #5 When hips do lie! #6 A wolf in sheep’s clothes! The hubby’s stash of Snickers! #7 When cleaning the fridge means eyes all over you. #8 Bound together for life. #10 When poetry meets the truth. #11 When whipping the cream turns into a macho job. #12 When a rose is replaced by Nokia as a symbol of eternal love. #14 When the wife could do with a more sober lunch! #15 “Put some spaghetti on the stove.” – taking things too literally! #16 When the parent needs some parental guidance. #17 When the hubby was asked to do grocery shopping but got distracted by an ice cream sale. #18 When the wife asks for some help with the laundry. Got any pictures to share of some funny antics of your hubby? Feel free to use the Comments section below!